I loved the The Lord of the Rings movies, and An Unexpected Journey had some precious scenes, but… what happened with The Desolation of Smaug? The story is simply becoming convoluted and risks losing track of the main characters. It also completely misses the tone and spirit of the book. I’ll start my review with words of praise. Martin Freeman continues to be brilliant as Bilbo. He manages to convey complex emotions through body language. After Bilbo kills a baby spider in Mirkwood, he falls to the ground clutching the Ring, nearly sick to his stomach. It’s an intense moment, showing Bilbo’s uneasiness with the Ring and violence more generally. I appreciate that Jackson respected the audience enough to not insert dialogue telling the viewers what Bilbo felt at this moment. Despite my disappointment with the Hobbit films generally, Freeman’s is easily my favorite depiction of Bilbo in any medium. The biggest problem in The Desolation of Smaug is the pacing. The action scenes go on too long, again repeating a problem from the first Hobbit movie. 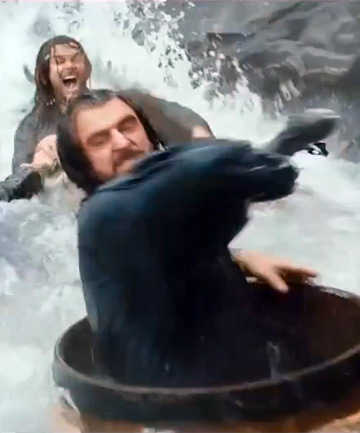 When I first saw this movie in the theater, the audience was laughing at the ridiculousness of the barrel chase down the river and at the fight against Smaug (there were some genuinely funny moments, but too often I got the sense that they were laughing at rather than with the film). Meanwhile, key scenes from the book are shortchanged. We barely get to see Beorn before the Dwarves leave his house. The Dwarves are imprisoned in Woodland realm for about 5 minutes. Moreover, most of that time is spent on a budding romance between Kili the Dwarf and Tauriel, a female Elf not in the book. When they reach the Lonely Mountain, the Dwarves wait outside the secret door for about a minute before giving up. This is a small scene, but telling. In An Unexpected Journey, Bofur gave a moving speech to Bilbo about how the Dwarves longed for a home. However, the Dwarves we see outside the secret door are not determined to win back their home. They give up way too easily without even discussing alternatives or contingency plans. If the characters don’t care about their own goals, it’s hard for the audience to care. I should say that I don’t mind Tauriel’s character in theory. In practice, the film placed far too much emphasis on her, taking away from the story of Bilbo and the Dwarves. The movie isn’t subtle about drawing attention to her. Howard Shore’s score includes a notably bombastic theme to introduce Tauriel as she hacks her way through spiders in Mirkwood. She’s not part of the ensemble of Elves but rather gets her own action scenes, even outshining Legolas. She then gets her own subplot, which culminates in an adolescent romance with Kili. I understand that Peter Jackson might have wanted to include a more prominent female character, but feel he would have been better off following his own example from the LotR movies. Jackson ingeniously gave Arwen a bigger role, but one that felt like a natural extension of her relationship with Aragorn and didn’t displace the main story. Overall, this movie is worth seeing if only for the visual imagery. Smaug looks glorious, even if he can’t kill any Dwarves. 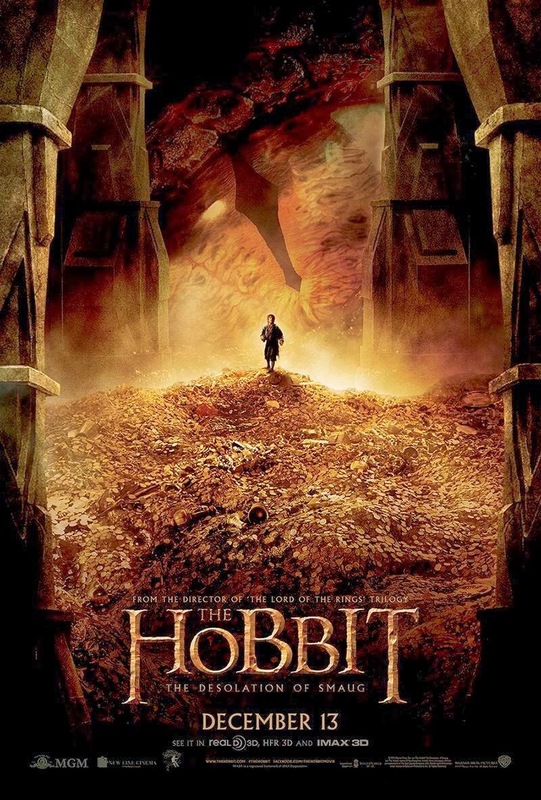 The conversation between Bilbo and Smaug builds tension in just the right amounts. It’s also not a coincidence that this scene resembles the scene in the book. Again, as with AUJ, The Desolation of Smaug works best when it sticks close to the books. It’s just that not much of the book made it into this film.